Brooks Brothers recently held their semi-annual sale. I was hounded by email every day encouraging me to make purchases. Usually I buy a few of their OCBD style dress shirts during the sale. They know that. What I like about Brooks Brothers shirts is that they offer a wide range of fits, sizes and collar combinations. Meaning that you can basically buy a tailored-like shirt off the rack. It helps that years ago a Brooks Brothers sales associate guided me to the perfect fitting shirt. From then on, I always ordered this same size. But as I was ordering new shirts during this sale, I noticed Brooks Brothers offered custom fit shirts. Great. I am a tall guy and having one or two more inches in shirt length would be excellent. I ended up scheduling a fitting in the downtown Seattle store. Even though I was a “regular” Brooks Brothers customer, I hadn’t shopped in the Seattle store for two or three years. When I arrived at the store for the fitting, a staff member directed me to the lower floor which was now closed off and appeared to be used mostly for storage. This was a bit surprising. Nevertheless, I enjoyed getting fitted and picking out the shirt fabrics with the sales manager. At one point, I asked him about a Brooks Brother Egyptian cotton dress shirt I had seen online. He curtly told me he knew nothing about the shirt. He followed that with, “look what online has done to me”, pointing to the expanse of empty shelves in disgust. His “online” comment hit me. I had a sudden guilt for my years of online shirt purchases. I remembered how the sales associates were a bit abrupt with my online returns. Then I gazed again at the empty floor with its bare shelves. And it all came together – I was looking at the death of retail. It was like Bruce Willis figuring out he was actually dead in the Sixth Sense (sorry if I ruined the ending for you … but it has been like 20 years). And the irony was not lost on me that I, Mr. VCleat, purveyor of shoe nostalgia, was contributing to the demise of American retail. I don’t think the retail death spiral can be reversed at this point but going forward, I will make a point to get off my phone and come into a store. I swear. Sorry. That was a long intro but I needed to get that off my chest. But to add to the irony, this post covers a pair of vintage Hanover saddle shoes that I bought online (ebay). I don’t feel bad about that because you can’t buy Hanover shoes through any retail channel. Pennsylvania based Hanover went through its own death spiral in the 1980s and 1990s. The company stopped making shoes over 20 years ago. The pair of shoes in this post were made by Hanover likely in the early 1980s. Above is a 1983 catalog image of the model (the ivy in the background was a nice touch and surely made the shoes doubly desirable). 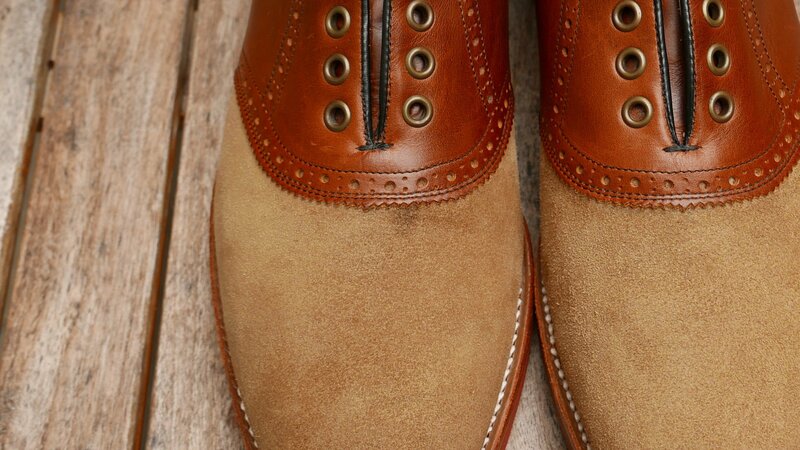 According to the description, the 4184 model had a Goodyear welted sole and a steel shank. Good stuff. 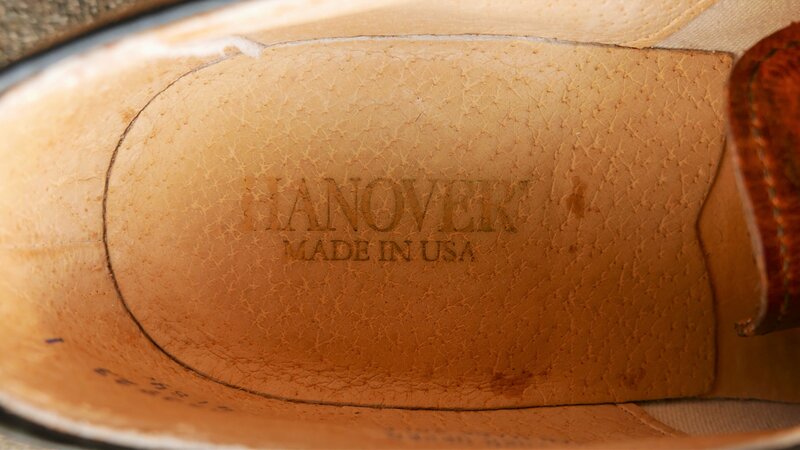 And if you are a savvy vintage shoe collector searching for a 12 EEE saddle shoe, Hanover appears to have made one in your size. The pair had very little wear but was dirty from years of inactivity. And neglect. Like my bike in the basement. To clean the upper, I used the suede shampoo process that I documented with the awesome blue Wright suede and horned lizard spectators. 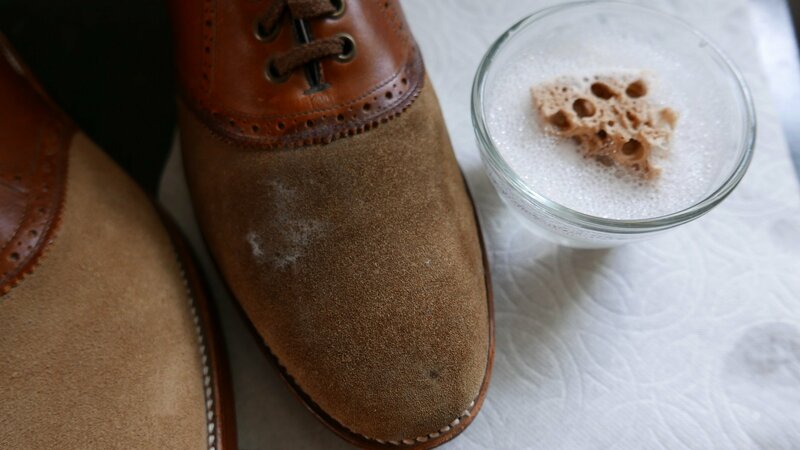 I dabbed the coconut shampoo and water mixture onto the leather using a sponge. The leather dried quickly and the pair looked like new. Almost. There was a dark spot at the top of the vamp on the right shoe that did not come out with the shampoo treatment. For that spot I used my Allen Edmonds Suede kit. The white eraser took off the stain and then I ran the nylon brush over the rest of the suede. 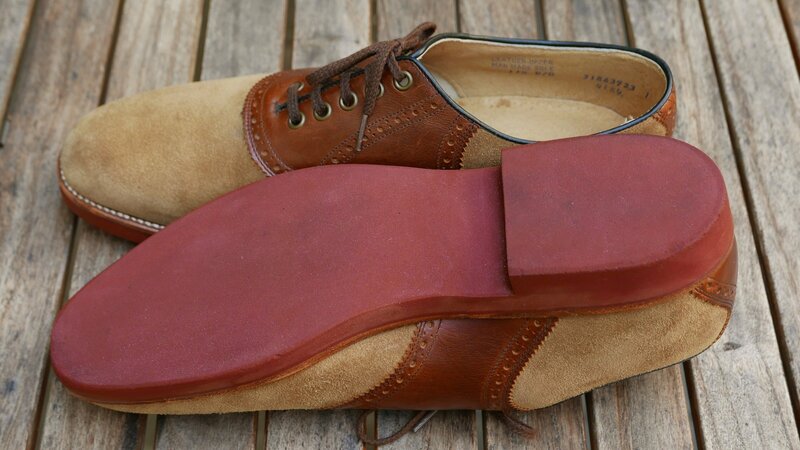 The saddle portion of the shoe is a British tan colored (coloured in Queen’s speak), calfskin. I was somewhat concerned that my shampoo treatment would cause water spots on the calfskin. But once dry, there were no marks. 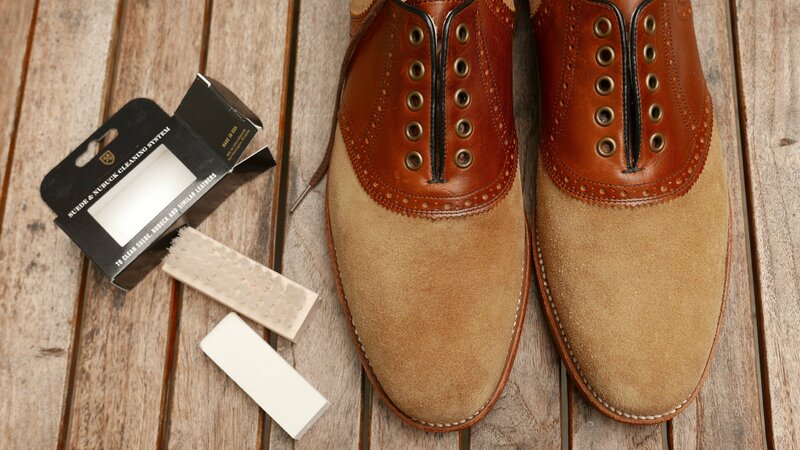 I used light brown Saphir cream to polish the calfskin and was careful not to get any on the suede. 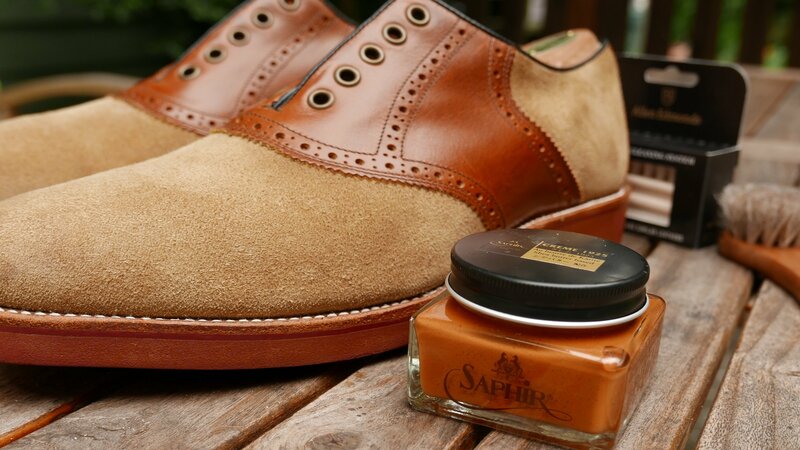 Saphir polish is a high-quality product that is a bit like liquid beeswax. The soles had light wear but had clearly been worn and were a bit dirty. To clean the soles, I used Mr. Clean’s MagicEraser. Which is a miracle product. I can’t explain how the product works so well but if available, I believe it could have turned the tide in our favor during the War of 1812. I have stated in past posts that I was not a fan of saddle shoes. 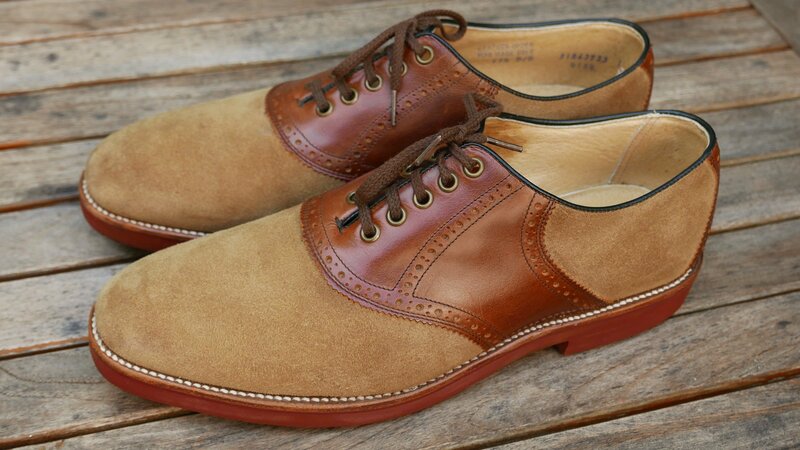 Those previous statements are inoperative because I like this pair. The shoes are very comfortable and fit true to size. I have been wearing them frequently during the past couple months. They are a great spring and summer pair. 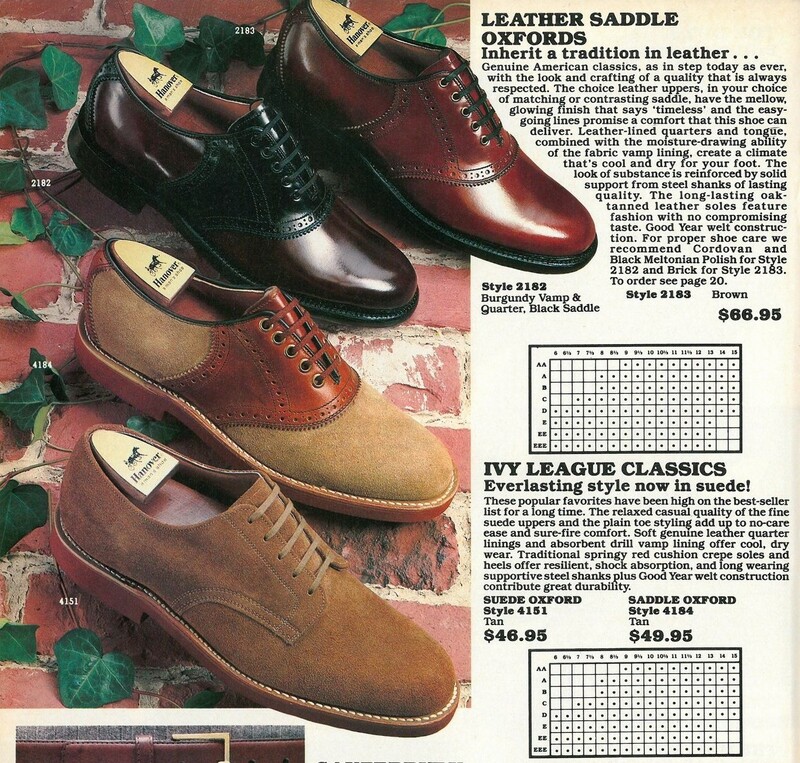 The 1980s weren’t the best decade for Made in USA shoes. Most of the manufacturers were dying or dead. 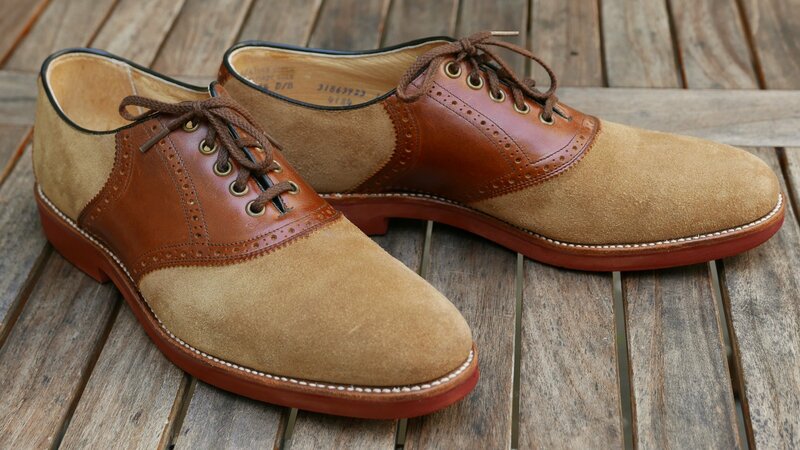 And the shoes that were produced often suffered from inferior materials. Still there were a few gems and I count this pair as one of them. Nice work Hanover. Below are a few more photos of the pair. Enjoy. And go visit a store this weekend. 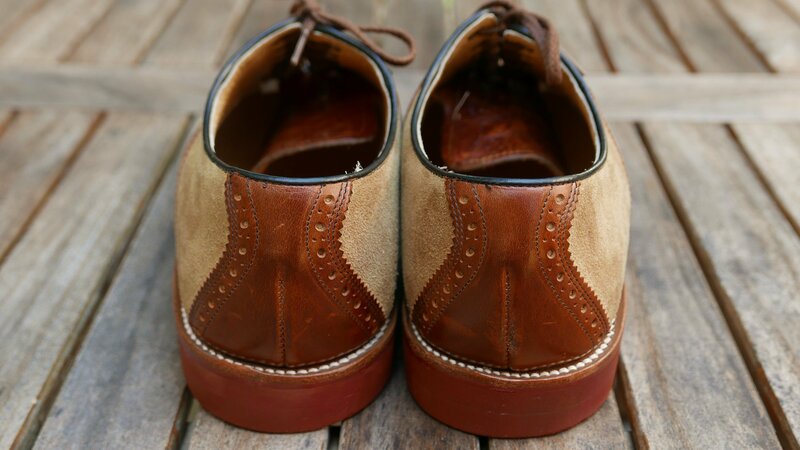 Fabulous read David as always now I have to find a pair of these saddle shoes in an 8D. I was leery of saddle shoes because st my vertically challenged height I was concerned they would make me look like a Peanuts character – Lucy van Pelt. However it may look good on others and I will admire them from a distance with silent jealousy. It took me awhile to find a pair I liked. I have bought other pairs but they looked like clown shoes. Or so I thought. Great restore on the suede and leather. 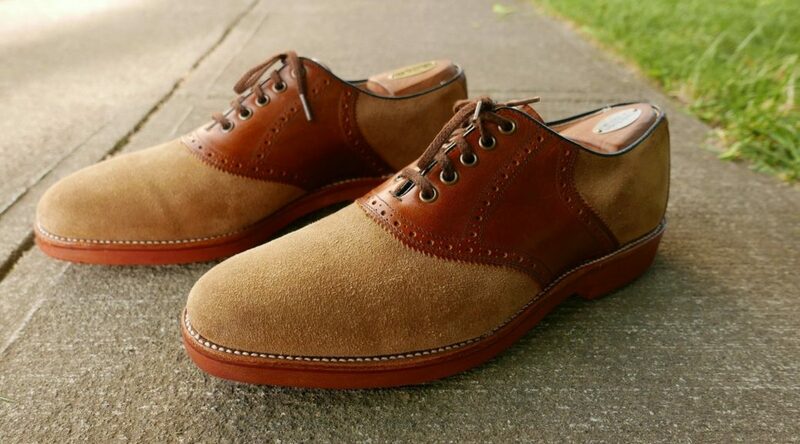 It’s good to know exactly what works with suede. 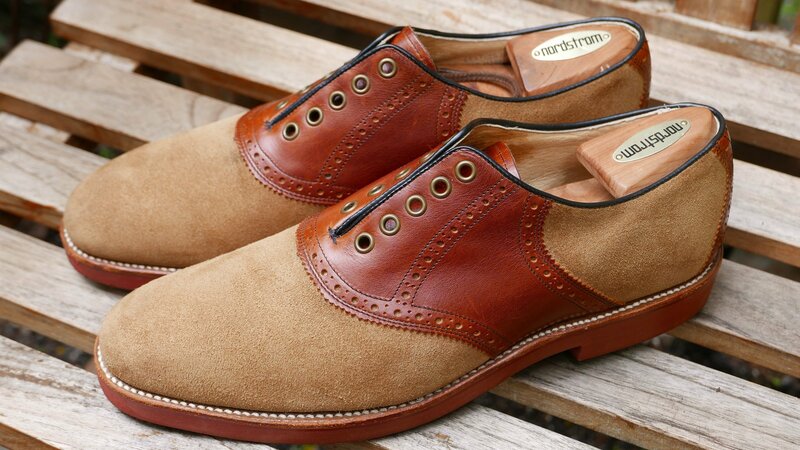 However, any advantage gained by Magic Eraser in the war of 1812 would have been outweighed by all the British wearing hand made in Northampton shoes! The shout out to the Canadian members is appreciated. Not sure what would have tilted the balance in the war of 1812. Maybe if Alden would send free shoes to all Canadians for life, that would’ve achieved something. Thanks. I was bitter for years about the war but then I ate poutine and all was good again.